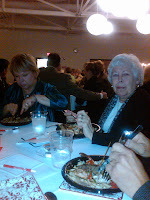 We attended a dinner at Mansfield Christian High School tonight. It was fun to see and talk to people I haven't seen for a very long time. The speaker was excellent and the food was amazing! All in all a good night...but long. I'm very tired. God has been amazing to our families. The faithful Godly walk of my parents has had an immeasurable influence on how I spend my life. I can never thank them enough. Tonight was a night of both looking back and looking forward with family and friends. It is good to look back at where you came from, it reminds me of the blessings that fill up my life.